Get 8 essential metal clay resources at one low price-for a limited time only! Perfect Your Metal Clay Skills . . .
Get 8 essential metal clay resources at one low price--for a limited time only! Compiling 200+ minutes of video instruction and 650+ pages of metal clay how-tos this combo pack is the ultimate collection to boost your skills. With these expert instructions you will learn a variety of techniques in no time. Join internationally renowned artist Sue Heaser as she offers all of the basic metal clay techniques perfect for the beginner and seasoned jewelry maker alike. There's something for everyone! Learn all the fundamentals from how to add textures to the clay to finishing your metal creation in this detailed resource. With over 500 photographs and a 10-page gallery of finished projects, Metal Clay for Jewelry Makers will provide you the inspiration and information you need to design your own metal clay jewelry. Perfect your metal clay basics as you acquire the skills you need to create your own metal pendants, bails, and more! Join instructor Susan J. Lewis and learn everything you need to know from preparing your work surface to polishing your artwork. You'll be transforming a tiny packet of clay into stunning handcrafted jewelry in no time! Make your mark with tips for creating unique textures, giving your piece a professional look, and so much more! Master creating hollow-forms from metal clay. Join instructor Susan J. Lewis in 4 watch-and-learn lessons as she shows you step-by-step how to handcraft your own metal lentil, cylinder, and sphere beads. Enhance your jewelry-making skills as you learn how to form unique artisan beads with the shape, size, and style you want. Plus, with Susan's expert tips avoid mistakes, make the perfect piece with sizing tips and shrinkage must-knows, and save money with tricks for using less precious clay for more design impact. Learn the art of metal clay from master teacher and jewelry artist Kate McKinnon. Known for her signature style featuring sculptural forms, she offers her tips, tricks, and methods for working with this medium. Unlock the design potential metal clay holds with this must-have eBook and digital download. Explore new techniques with step-by-step pictures and directions. Then, put your skills to the test with 10 one-of-a-kind projects that combine the foundation skills with one-of-a-kind design elements. Discover jewelry making and the basics of metal clay like never before. Learn all about the special characteristics of different metal clays including silver, copper, bronze, and steel. Create rich textures in minutes, make stone settings simple, and use organic materials for patterns, all without soldering! Don't just read about these techniques, craft 25-spectacular projects with easy-to-see step-by-step photos, be inspired by a beautiful gallery of jewelry, and so much more with this must-have resource. Explore texture, surface design, and new techniques as you craft 10 beautiful jewelry projects. Unlock the vast potential metal clay holds as you create a collection of pendants, rings, earrings, and bracelets in a wide variety of styles. Packed with 14 amazing clay jewelry projects, create one-of-a-kind pieces with clay designs you can shape yourself! Learn the most popular jewelry techniques in metal, polymer, and ceramic clays. With step-by-step directions and illustrations, form your own beads, findings, and more! Prepare to make your mark with these exciting projects and directions. 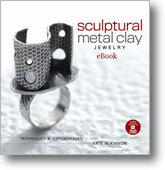 Perfect the most popular jewelry trends in metal, polymer, and ceramic clays with detailed directions and illustrations. Make your own metal clay findings including clasps, bead caps, and more. Discover the secrets of setting a stone in metal clay, and save money and have everyone looking twice with a faux stone polymer technique.